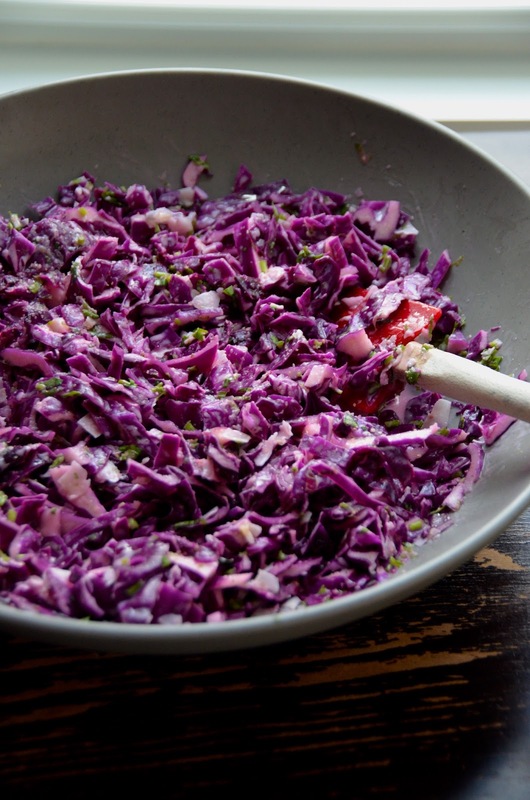 This Coconut Lime Cabbage Slaw recipe was a collaborative effort between one of my friends and I.
I created the coconut lime dressing to use on a carrot salad I often served as part of my menus at Good Commons, the retreat center my friend owns where I cook during the summer. 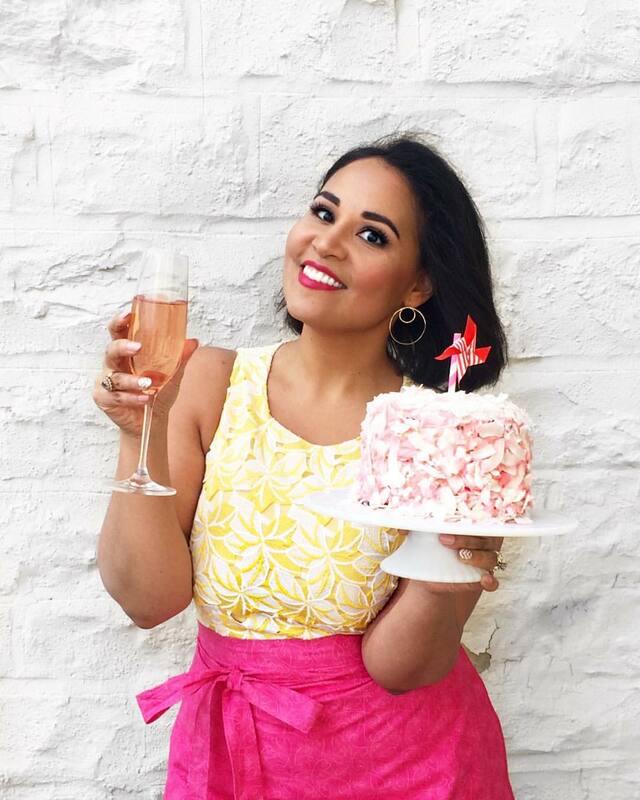 She fell in love with the dressing and started using it with shredded cabbage as a vegan coleslaw to serve during a annual bbq she caters every year. I helped out with the event one summer, and fell in love with the way she used the dressing on cabbage. I then took THAT idea, added a few touches of my own (cilantro! coconut flakes!) and a new favorite coleslaw recipe was born! 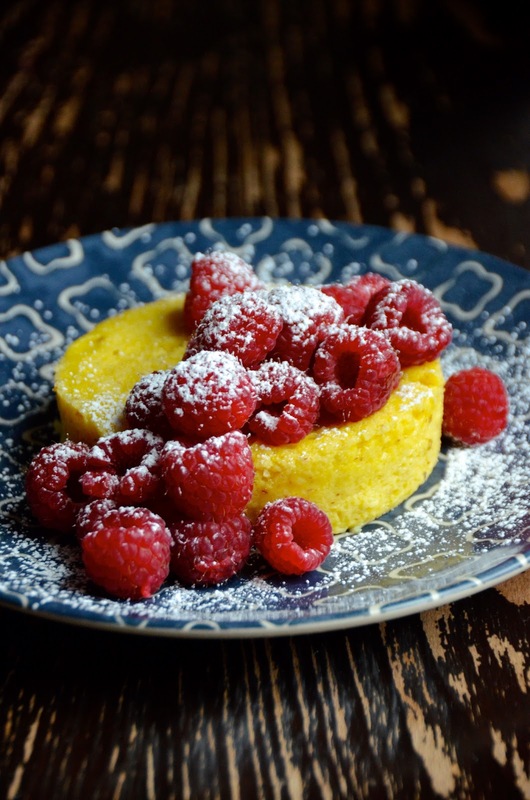 This easy low-carb flourless microwave lemon pudding cake is one of my favorite weeknight treats! Lemon desserts have long been my favorite, and this tart, spongy, pudding cake is the perfect cozy end to the day. 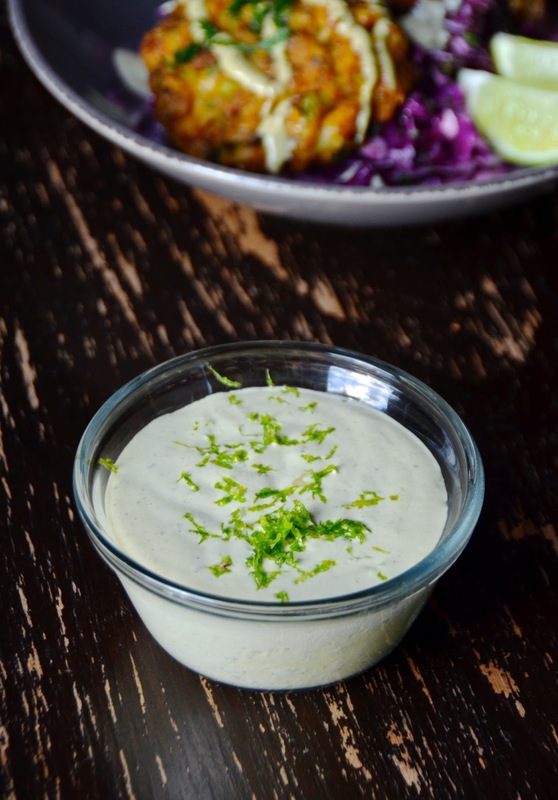 This easy spicy Roasted Jalapeño Lime Remoulade is the perfect topping sauce for crab cakes or fish tacos. It's also wonderful as a dip served with fried shrimp, dolloped over oysters, or to use in sandwiches or burgers. Roasting the jalapeños softens the heat a bit and adds a touch of smoky charred flavor to the sauce. You can roast the peppers under a flame broiler or on a traditional grill. If you don't have either option, you can also roast them in a 425 degree F oven for about 20 minutes, though you likely won't get the same charred exterior. 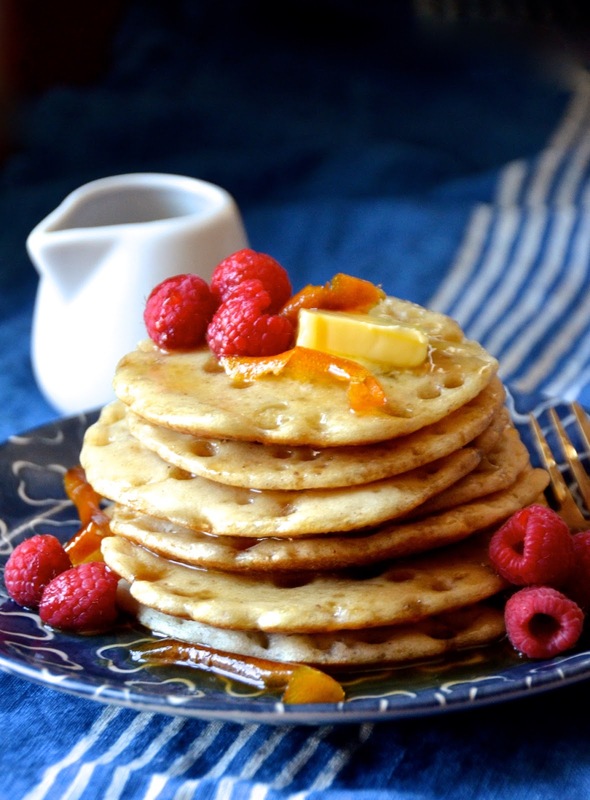 Meet my new favorite pancakes!! Baghrir are a type of Moroccan crepe or pancake made with semolina flour (the same flour used for cous cous and many types of Italian bread and pastas). The batter for baghrir is made entirely in a blender and then allowed to rest for about thirty minutes before cooking. The pancakes are cooked on a skillet just like American-style pancakes, with one big difference--no flipping! Tender butternut squash, sweet caramelized maple syrup, and salty feta hits every single one of my favorite flavor notes in this showstopper of a dish! I prepped this recipe for my TODAY Show segment this week along with an equally fab chile-maple marinated steak, but time was tight so unfortunately we didn't get to it on the air. But this baby is way too delicious to stay hidden, so here it is!! 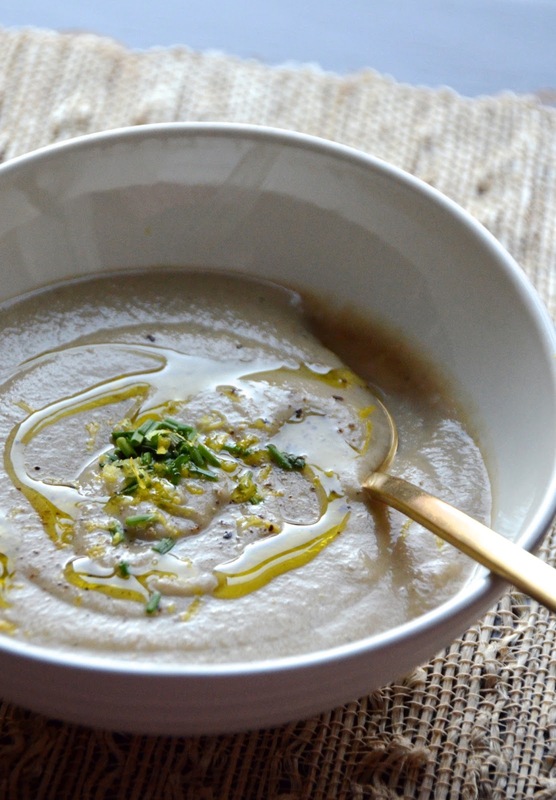 Believe it or not, this creamy mushroom soup is made with absolutely no flour or potatoes! To thicken the soup, I use parsnips, which add creaminess with much fewer carbs. I also love the slightly floral and herbal notes of the parsnips; they contrast beautifully with the earthy mushrooms. This recipe is a simple one to make, simply simmer all the vegetables until tender and reduced, then puree into a smooth creamy soup. For the best flavor, find the fanciest mushrooms you can get and choose a variety of them. Plain old button mushrooms will work, too, but don't do much in terms of flavor. Since the mushrooms are the stars of the dish, you'll want to pick something with a bit more depth like shitake, crimini, or even portabella mushrooms. You can puree this soup in batches in a regular blender or use an immersion blender right in the pot. 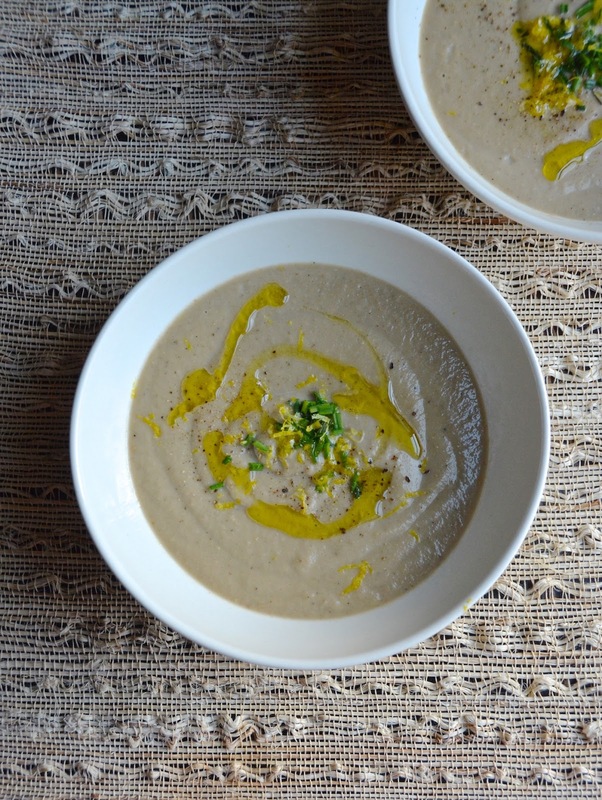 I love to serve this soup topped with fresh chives, a shower of lemon zest and a drizzle of olive oil. Looking for more creamy soup recipes? Try this Creamy Chestnut Soup, my Creamy Roasted Red Pepper and Carrot Soup, or my Salmorejo (a chilled, creamy gazpacho variation). 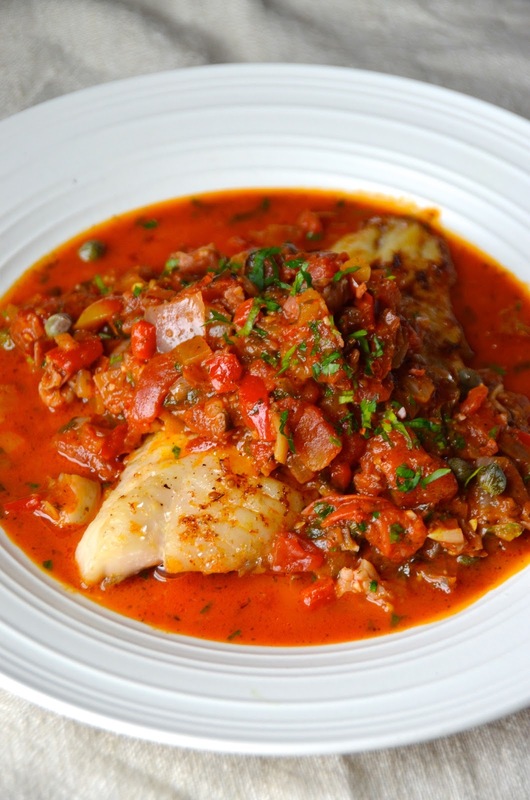 Melt butter in a large heavy-bottomed pot or Dutch oven over medium heat. Add the onion, season with salt, and let cook, stirring occasionally, for 15 minutes or until onions are soft and start to caramelize. Stir in the celery and garlic, and sauté two minutes, or until fragrant. Add the mushrooms, season with another generous pinch of salt and a crack of black pepper. Stir to coat well, and cook 10 minutes, stirring occasionally. Add the sherry (or wine) and cook, stirring, until liquid is evaporated (about 2 minutes). Add the chopped parsnips, broth, bay leaves, thyme, sage, lemon zest, and juice. Bring to a boil, then reduce heat and let simmer, uncovered, for 30 minutes. Add the cream, and simmer an additional five minutes, then remove from heat and let cool slightly. Remove the bay leaves (be sure to count out all four! ), and any stems from the sage and thyme. Puree the soup using an immersion blender, or in batches in a standard blender, transferring it all into a clean pot once smooth. Taste and adjust seasoning with additional salt and pepper, to taste. Serve soup garnished with a sprinkle of chives and fresh lemon zest.